Paris and Neelix must put their personal issues aside when they are stranded on a dangerous planet and are forced to take on an unexpected responsibility. This week, on "Who Wore It Better?" Matthew: We have made quite a bit out of what a jerk Neelix has been written as in this first season and a half, and I think it is well deserved. Neelix has come off as creepy and controlling in his jealousy surrounding his relationship with Kes. 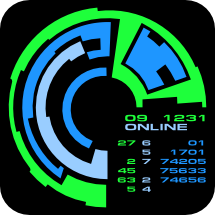 To their credit, the writers and producers of the show realized it as well and felt it necessary to engage in some course correction - namely this episode. An episode like this could be interminable, but I think it turns out reasonably well. The A story is the Paris/Neelix relationship, and I think it is developed in an interesting enough way not to seem arbitrary or inorganic. The plot is a well worn one - two antagonists reach an understanding through shared adversity. But as they have conversations about their checkered pasts, Neelix's mea culpa and Paris' regrets were really genuine, the evolution of a nascent friendship was believable. Kevin: In the balance, I would rather that they not have needed this episode in the first place, but given the last few episodes, I'm glad they did it. That being said, I agree that the episode largely works. 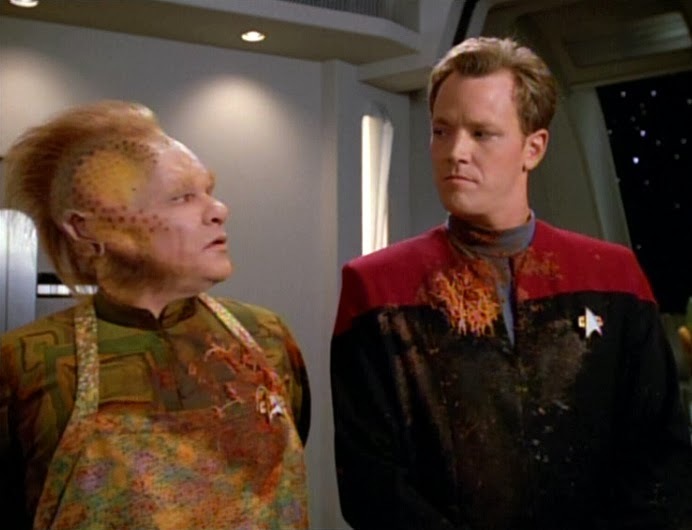 I remember not liking this episode a lot when I first saw it, but I think that may have been my extant dislike for the Neelix character bleeding all over the episode. I liked that they acknowledged Paris is actually attracted to Kes, as it gives the problem a little more complexity. Their bickering was good, too. The problem that forces them together is a little artificial, but not problematically so. I will say I had one problem with food fight. Paris throwing the pasta back at him seemed not to match the expression on his face. He was shocked, not angry, and it seems like the writers just wanted a food fight. Matthew: The scenes aboard ship were a nice slice of life - with Harry playing clarinet and discussing Tom's love life, the general scene in the cafeteria, and the good solid comedy of fighting characters being called to the Captain's ready room unexpectedly.Whatever the problems with the B story are, there were plenty of character moments to buoy a viewer who likes or could possibly like these characters. Kevin: The scene with Harry and Tom was nice, and I really, really liked the scenes between Kes and the Doctor and Harry, as her being angry and confused at Neelix's actions elevates her from a mere prop in Neelix's story. She has her own emotions, and seeing her navigate them is interesting, even if does kind of underline the idea that she is not entirely equipped for the relationship with Neelix. Matthew: The B story of the baby alien wasn't bad, but it wasn't memorable. Perhaps if they had been put in more comedic situations with it, or if there had been more bonding between the baby and the away team, it could have worked. As it was, it was inconsequential outside of what it showed us of the characters. We didn't really learn much about this alien reptile race besides the fact that they leave their eggs on some random planet with "trigemic vapors," which is pretty rank treknobabble. Why would a warp capable species do such a thing? Kevin: It would have made more sense if they were an indigenous, pre-warp civilization. Also, the ship attacking Voyager was a bit on the boring side. It did exactly what the story needed, delay the ship and nothing more. One side effect of one or two crew members ending up in danger plots, is that we are getting a lot of plots that end up being Janeway suggesting technobabble solutions to the bridge crew. The scenes are bad, they are just getting a little repetitive. I did like the sparring between Tuvok and Chakotay though. Matthew: This episode, in addition to Season One's "Jetrel," is a real showcase for Ethan Phillips. He has been given such crap roles with the jealousy stuff, that to see him behave with subtlety and complex emotion in his scenes with Robert Duncan McNeill is a real treat. McNeill is typically good. He doesn't expand on much prior work in his scenes with Phillips, but it all works very well. His scenes with Jennifer Lien and Garret Wang, though, were a nice new "lovelorn" flavor for the character. Kate Mulgrew had a terrific brief scene with her "am I discerning a personal problem" dressing down of Paris and Neelix. Kevin: Whatever the sins of the plotting, even over the last few episodes, Phillips is a good actor and he does his best to make Neelix's motivations at least internally credible. Their resolution came a tad fast for my tastes, but both actors definitely sold it. I like that on Paris' side, his choice of how to act or not act on his attraction to Kes is part of his attempt to rehabilitate himself. Matthew: The alien puppet, though not particularly interesting to look at, was a pretty impressive piece of animatronics, with neat body, eyelid, eyeball, and mouth movements. Planet Hell looked OK. It was smoky, and the cave was reasonable to look at. I thought the "glowing rock" trope was particularly well done. Kevin: I didn't like the adult version of the alien. Despite being the one with an actual human underneath, there was no movement underneath the makeup. The Planet Hell scenes bothered me not out of any sense of lack of detail, but there was a murky color palette that made all the scenes drab and washed out. Matthew: Alfarian Hair pasta looks like Angel Hair. It wasn't terribly exotic. But it made for a nice food fight, and the continuity of pasta on Paris' uniform between sets was good. Matthew: This is a pretty easy 3 for me. Like many a Voyager show, a so-so sci-fi plot is ameliorated by fine character stories. I don't know if an episode like this (tasked with heavy character lifting in rehab of Neelix) could ever be better than it is. Perhaps a more slam bang sci-fi story could have supported the same character work. But it's mildly entertaining throughout and never strains the viewer's patience or credulity too far. Kevin: This is a solid 3. The attempt to rehabilitate Neelix, and depicting Kes as a person with feelings and reactions go a long way to compensate for some of the shortcuts the plot takes to set up and resolve itself, but still, there was plenty to enjoy here. That makes a total of 6.